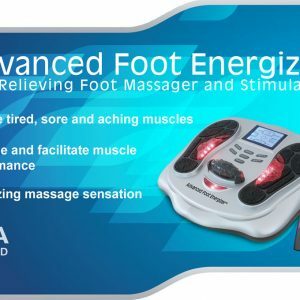 Advanced Foot Energizer® Energize Your Feet and Legs! The best way to find our how the Advanced Foot Energizer can help you is to try it for yourself. We invite you to experience healthier legs and feet with our risk free trial. We’re so confident you’ll love your Advanced Foot Energizer combination TENS & EMS foot massager and stimulator that we’ll let you try it RISK-FREE with an incredible no-risk 60-day money back guarantee. We want to allow you ample time to test your investment in your health. Just call to arrange for a return authorization code and ship it back to us in the original packaging. Join email list to receive a free 10% discount code. † Advanced Foot Energizer is a trademark registered in the US Patent and Trademark Office.